We stole this photo from here, a photo log of aptly enough, inpiring aprons. Need more? 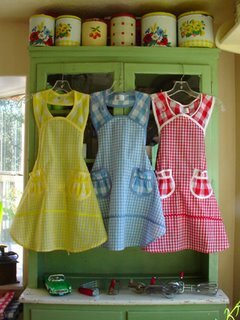 Here is a Flickr group dedicated to vintage aprons. 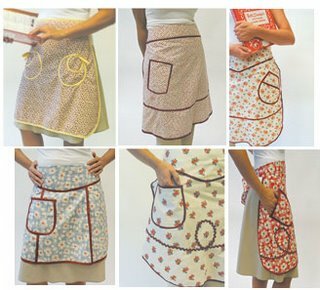 Free apron patterns can be found all over the web. Here’s a simple one. Or maybe a gardner’s apron more fits your whim. One for all you crochet converts out there. Here’s a totally crazy one that we aren’t even sure is an apron but we like anyway. Once you’ve become an apron master, check out Tie One On, which offers monthly apron challenges and galleries. This month’s challenge is a tiny doll apron, but we like last month’s mapron (man apron). It’s just fun to say. Mapron, marpon. See?